The Trump administration’s plan to privatize the nation’s air traffic control system moved forward in the House Transportation and Infrastructure Committee Tuesday, despite concerted opposition from Democratic members of Congress. The committee approved the 21st Century Aviation Innovation, Reform and Reauthorization Act (H.R. 2997) 32-25, with all Democrats present voting in opposition. 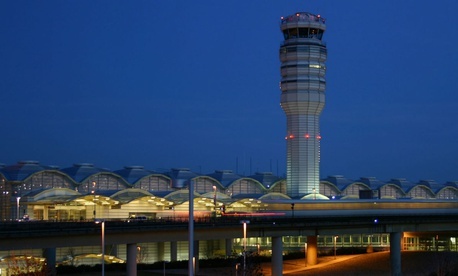 The measure reauthorizes the Federal Aviation Administration, and it transfers the agency’s air traffic control operations to a private nonprofit corporation. The Trump administration held a signing ceremony for the principles it wished to see in a privatization bill earlier this month. Under the House proposal, introduced by Transportation Chairman Bill Schuster, R-Pa., the corporation would be governed by a board of directors made up of representatives from airlines, employee unions, and general aviation and airport trade groups. The nation’s 30,000 air traffic control employees would shift to the new nonprofit entity, and their existing collective bargaining agreements would be honored. Instead of taxes funding the organization, the corporation would establish a user fee on passengers on a per-plane basis. The National Air Traffic Controllers Association formalized its support for the legislation once it was officially introduced last week. But unions representing other sectors of the FAA workforce remained opposed to privatizing air traffic control operations. During the Tuesday markup session, Rep. Peter DeFazio, D-Ore., the top Democrat on the committee, proposed an amendment that would replace the language of the bill with his own counterproposal, introduced in the House earlier this month. Schuster, however, said DeFazio’s proposal, which removes the FAA’s funding from the appropriations process—and thereby from threats of government shutdowns—and orders personnel and acquisition reform efforts, is a rehash of failed agency reform efforts. DeFazio’s amendment, as well as a number of other changes to the bill that would have increased government oversight, added consumer advocates to the nonprofit corporation’s governing board, and made it harder for the corporation to sell air traffic control system equipment and other assets after the transition, all failed along mostly party lines. One Democratic amendment, proposed by Rep. John Garamendi, D-Calif., saw a more welcome reception. Following what Garamendi described as an “unclear” response from Transportation Secretary Elaine Chao on the question of whether the ATC nonprofit corporation would receive any FAA funding when it is established, he sought language preventing any money from the Airport and Airway Trust Fund from being transferred to the new entity. And while Republicans opposed an amendment proposed by Rep. Eddie Bernice Johnson, D-Texas, that would require FAA and independent audits about the value of the assets—including equipment, property and any liabilities—that would be transferred to the new corporation as part of the ATC privatization, Rep. Sam Graves, R-Mo., said he and Schuster were committed to working with Johnson on including the proposal in some form. A vote on the House floor has not yet been scheduled.